Mr. Gallo is a graduate of Philadelphia Wireless Technical Institute with undergraduate studies at the University of Maryland. While studying electronics, he joined the Navy Reserve. Called up for active duty in May 1966, the Navy sent him to Cryptologist training and assigned him to the USS Liberty, a Navy intelligence ship. While completing a NSA mission off the coast of the Sinai, June 8, 1967, the ship was deliberately and brutally attacked by Israel during the Israeli/Arab Six Day war. While surviving the attack, his memories continued to haunt the gruesome nature of the event. The Navy Court of Inquiry declared the attack accidental, however, the survivors knew differently. Realizing something was very wrong with the Navy, when his Navy enlistment was completed in May 1968, he reluctantly left the Navy as a Second Class Petty Officer, Communications Technician, Maintenance Branch (CTM-2). To continue his Cryptologist and communications expertise, Mr. Gallo applied to work for the Central Intelligence Agency and was accepted. He completed a 28 year career with the CIA and received the CIA’s Civilian Intelligence Award, the Commendation Medal. Following the CIA, he worked for GTE, Quality Services Incorporated, TriCorps, Marconi International and BAE taking him into retirement. Ernie is a member of: Veterans of Foreign Wars; The Navy League, Naval Cryptologic Veterans Association; the USS Liberty Veterans Association, and the American Cold War Veterans. He is the current and former President of the USS Liberty Veterans Association and founder of the Liberty Foundation. 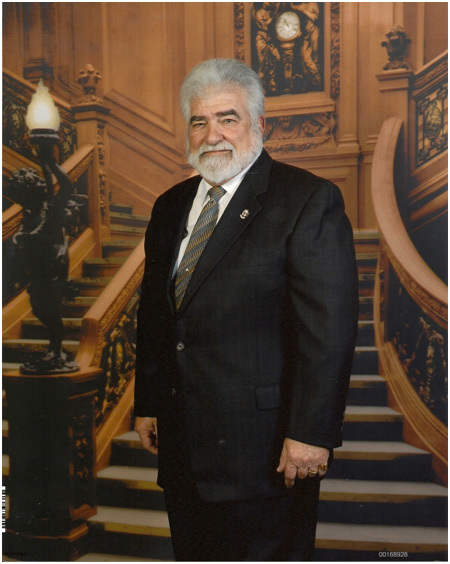 Mr. Gallo is on the board of directors of the Daytona Beach Navy League Council and the American Cold War Veterans. In 2005, he created a “give back” project of collecting used books delivering them to the various Navy and Coast Guard commands around the area. The project is called, “the Captain William McGonagle Memorial Library”, named after the beloved skipper of the USS Liberty who received the Medal of Honor for this leadership and dedication to save as many lives as possible. Mr. Gallo has completed Michael Ray King’s training, “Wright a book in 30 days” and authored, “Liberty Injustices – A Survivor’s Account of American Bigotry”. The book tells the USS Liberty story and captures his passion to alert America of a major problem. As a Navy veteran and roving activist speaker, the result of telling the truth about the Israeli attack he and the Liberty crew have been subjected to bigotry and character assassination. Ironically, the USS Liberty is the most decorated Navy ship for a single engagement ever. Two Hundred and eight Purple Hearts were awarded to the Liberty crew alone.